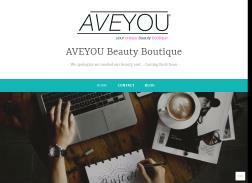 AveYou is a beauty boutique offering hair, nail, skin, and body care products. Its products have featured in numerous magazines such as Beauty Store Business, New York Magazine and Us Weekly. Customers say that products have exceeded expectations and arrived promptly in delivery. 20% off on entire order! Free Shipping on All Orders. Expires 3/30/2012 at 11.59 PM EST. $25 Off $100 or more. Expires on 07/31/2014. $25 Off $100 or more plus $1 shipping. Expires on 09/30/2013. Get $25 Off $100. For online use only. Cannot be combined with other offers. Cannot be applied to orders that have already been placed.